The machine vices of the TC and LC series are part of the renowned product range of the specialist ALLMATIC-Jakob. Maximum precision for workpiece machining, up to eleven pre-settable clamping force levels and high repeatability are the current parameters for this success. Now the experts from Unterthingau are further improving the TC and LC vices and present a uniformly structured complete series under the new label “NC8”. The new product range consists of six models with various jaw widths. The NC8-90 and -125M have location holes with an inside micrometre of 200 mm, which allow the use of the most widely available zero point clamping systems. The models 125, 160 and 200 impress with their bore holes for clamping width extension. Pre-setting of the force can be carried out in seconds on all products without the need for tools. As up to now with the TC, ALLMATIC also grinds the NC8 laterally, which further increases the accuracy of the vices. The new vices are thus ideal for daily use with 3-sided and 4-sided machining. Full compatibility with the current LC / TC models is ensured without additional programming. 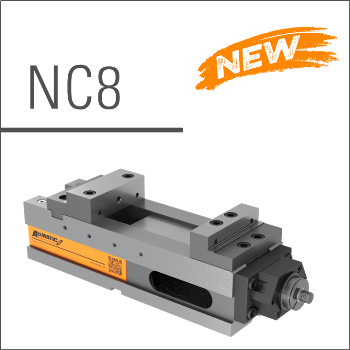 The NC8 thus offers all essential features at attractive prices. Nevertheless, ALLMATIC guarantees availability of replacement parts for the expiring successful models LC/TC for the next 20 years.